Play is young and cheerful and fresh: precisely what lunch on a wintry day requires. Its prime mover, Stephen Beckta, is manning the coat check as we stomp through the York Street door, shaking flurries off parkas, handing over soggy mitts. He takes on our burdens with habitual grace, and then leads us to a sunny upstairs table by a big, old window where we bask in the competent ministrations of a perceptive staff. We are here to taste Play’s any-two-plates-for-$20 lunch, and drink a glass of wine suggested by a menu that pairs every dish with a proposal for best match, in three and five ounce pours. The presentation on the plate of the ‘S2S’ chorizo is striking, and the Frontenac County artisanal Seed to Sausage salami is very good. We don’t plan to eat it all, but hand goes from plate to mouth to plate again with embarrassing repetition, sometimes dunking the marbled, well-spiced sausage in the curls of Dijon mustard, sometimes not. 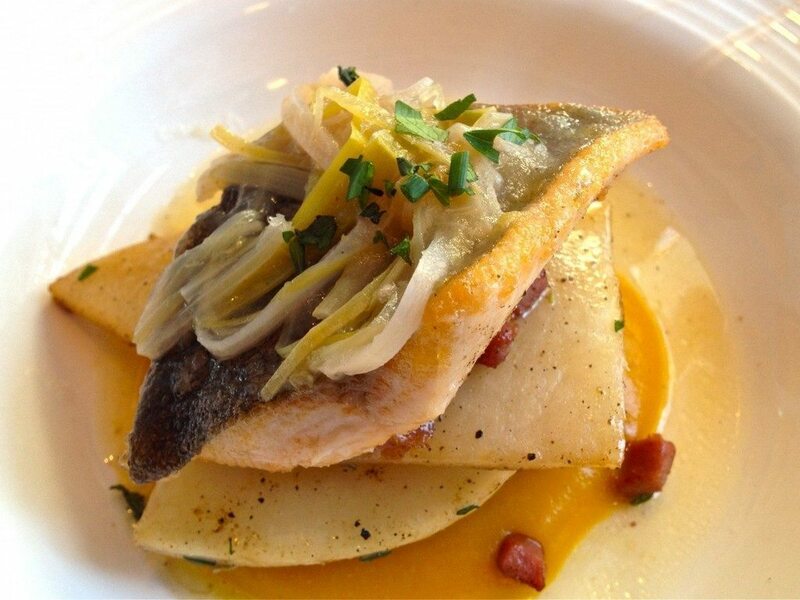 Next course, trout, yielding just right, in a sweet cider pool surrounding a silken squash purée. Layered above this, a few bitter disks of well peppered turnip, some soft ribbons of leek and a toss of chewy proscuitto for a bit of meaty, salty yum. A terrific dish. Feeling we’d had a deal of a meal, we splurged on dessert: a stunner of a chocolate terrine, generous enough to pass around (and around).